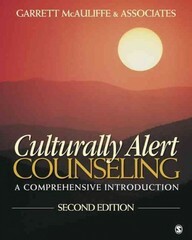 Culturally Alert Counseling 2 Edition The Second Edition of Culturally Alert Counseling is a thorough update to the first comprehensive guide to culturally alert counseling, complete with a companion demonstration DVD. Co-author and editor Garrett J. McAuliffe expands the traditional "definition" of multicultural counseling from the usual two categories of race and ethnicity to seven groupings. The book and companion DVD encourage readers to examine the complex nature of culture and how it impacts all stages of the counseling process.